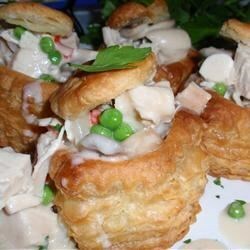 "Turkey, peas and mushrooms in a creamy sauce to serve over puff-pastry boats, biscuits, toast or rice." In a large skillet over medium low heat, cook butter until golden brown. Saute mushrooms until tender. Stir in flour until smooth. Slowly whisk in chicken broth, and cook until slightly thickened. Stir in cream, turkey and peas. Reduce heat to low, and cook until thickened. Season with salt and pepper. A tablespoon or two of Marsala wine takes the flavor up another notch. This was fantastic for such a simple recipe. I used Land O Lakes fat free Half and Half and also added one Tablespoon of cooking Sherry. Delicious! I served this over wide noodles and everyone loved it.